Around 100 participants called for an end to "persecution". 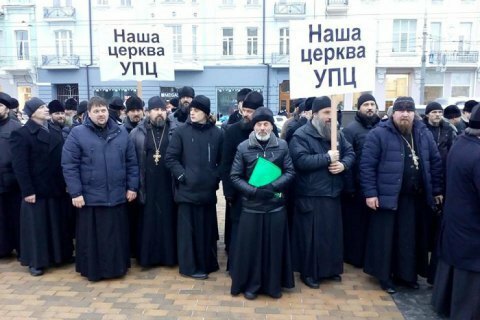 Around 100 priests of the Ukrainian Orthodox Church of the Moscow Patriarchate (UOC MP) rallied in Vinnytsya on 4 January, according to UA:Vinnytsya. They first held a rally outside the regional state administration, holding banners calling for an "end to persecution of the UOC MP", and then walked along central Vinnytsya. The priests represented the eparchies of Tulchyn, Mohyliv-Podilskyy and Vinnytsya. Metropolitan of Vinnytsya and Bar Simeon (Shostatskyy) was one of the two archbishops of the Ukrainian Orthodox Church of the Moscow Patriarchate to join the newly-established single Ukrainian Orthodox Church. Therefore, there is an active transition of parishes from the UOC MP to the UOC in the region.